If you’re an habitual reader of this blog you surely know I mostly speak about Linux, well this article is about FreeNAS which is not based on Linux. FreeNAS is an enterprise-grade operating system based on FreeBSD and the most complete solution on the market. Let’s discover it now! Buy a multi-purpose modem/router/access-point with USB and attach an external drive. Buy a pre-built NAS which needs internal drives. Assemble a computer and transform it in a NAS. Most people will indeed choose one of the first two options (which are not bad at all). However there are people who decide to assemble their own NAS. Building one usually costs much more than buying an assembled one, but it pays off in the long run. Most pre-built NAS come with 2, 3 or 4 drive bays and can’t really protect against data corruption even though they are using RAID. A pre-built NAS will most likely have near-to-zero computational power (weak CPU) whilst an assembled one might have a decent CPU. But after these few considerations (and usually after building the NAS) comes a big question: which operating system? Now fanboys will yell their favourite Linux distribution out loud, but there are specialized operating systems for this purpose like unRAID, FreeNAS, NAS4Free or OpenMediaVault. So why don’t we take advantage of these instead of building everything onto *insert distro name here*? In this complex scenario FreeNAS emerges as the first choice. FreeNAS is a free operating system based on FreeBSD that is able to provide enterprise-grade features. The purpose of FreeNAS is of course serving files, but it can also offer block devices. But the real killer feature is the protection from data corruption (assuming the server uses ECC RAM). Through the use of ZFS, FreeNAS is able to protect from data corruption and even silent data corruption and device failure using a RAID-like system called RAIDZ (based on ZFS). You can also use FreeNAS to share your files on Windows, Mac OS and Unix-like system seamlessly. FreeNAS will also support Windows Backup and Apple Time Machine. If you care about encryption, FreeNAS has got you covered, you can encrypt your files (provided your processor supports AES-NI.) ZFS, hence FreeNAS, supports snapshots meaning you can stop changes to a specific filesystem to access its files in that precise time while still being able to modify the files. All of this is accessible through a great web interface that gives you control on pretty much everything. Still not convinced? 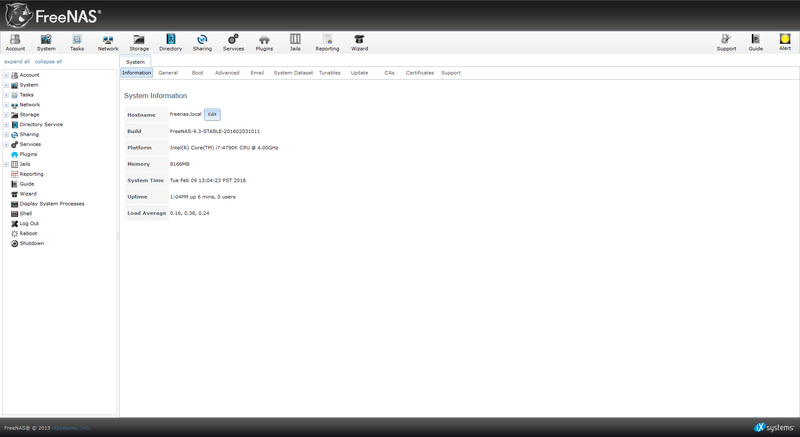 FreeNAS has also got plugins: software like OwnCloud, CouchPotato, SickBeard, Transimssion will be at your fingertips directly installable from the web interface and integrated with your existing FreeNAS environment. Although all of this is pretty wonderful, be careful: all that glisters ain’t gold! You will need quite a few things to run FreeNAS properly: ECC RAM, Motherboard/CPU with ECC-support, about 1GB RAM per 1TB of space. FreeNAS itself suggests to use a system with at least 8GB RAM. As you can see FreeNAS is quite memory hungry, that’s because of ZFS and its data protection features. If you were thinking of buying a pre-built NAS and I incidentally stopped you, be wary, assembling a computer and setting up FreeNAS will bring more troubles compared to a packaged solution. If you were wondering what operating system to install on your brand new assembled NAS, FreeNAS is your best shot (although there are alternatives, I’ll speak of them in the future). Polished, secure and rock-solid, FreeNAS is an enterprise-grade software that does much more than its name says, definitely worth a shot. Image thanks to Dave Monk.